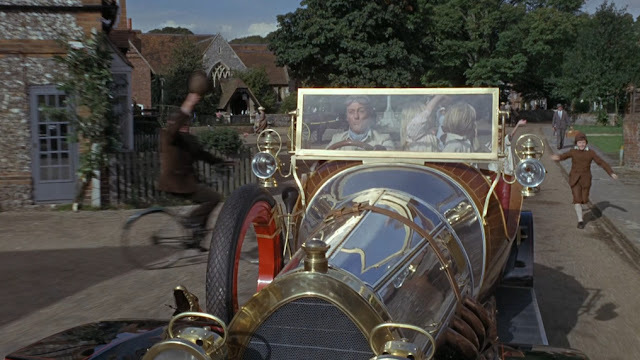 Just watched Chitty Chitty Bang Bang (1968) with the offspring tonight. Still a brilliant film after all these years. 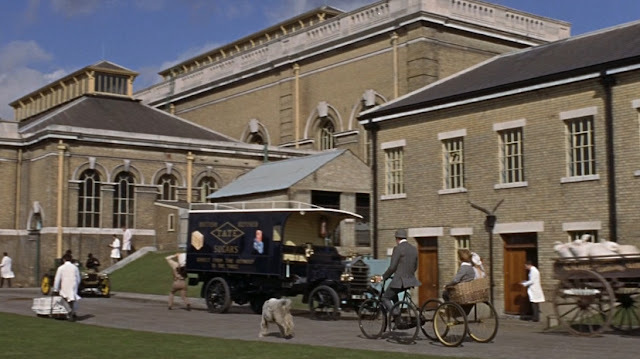 Seen it many times, but never noticed the one quick scene when Professor Potts heads to the Scrumptious Sweets Co. to pitch his Toot Sweet concept. A fine upright tricycle with a comfy trailer for his kids. 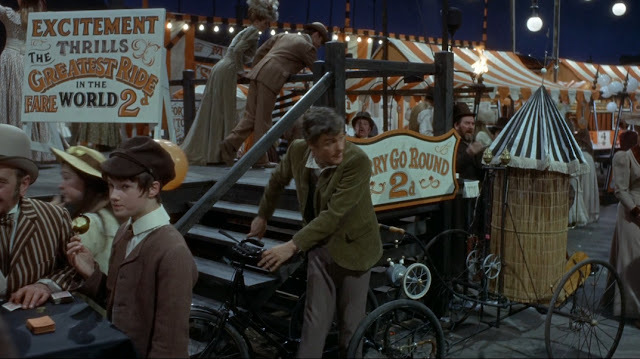 Being an eccentric inventor, Prof. Potts also pulled a automatic, electric hair cutting machine by trike later on. Cargo bike goodness. 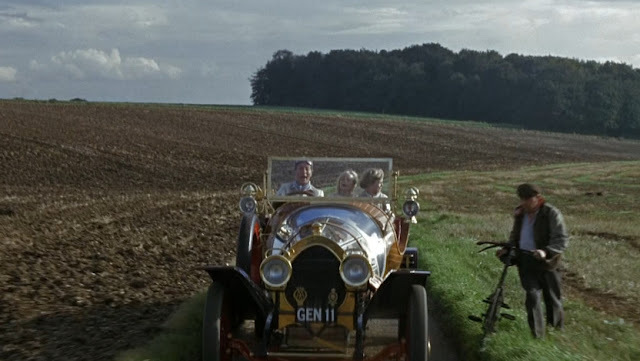 And our pretty Chitty Bang Bang loves us, too. The envy of all they survey, indeed. Driving through villages, everyone waves at them. Including an allegedly envious cyclist. Saluting a Man with a Car - one that is no longer considered a wacky, cycling inventor. 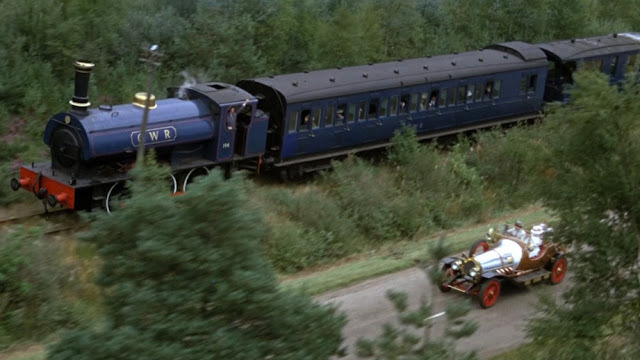 The car also outperforms the train to the coast. Selling the independent mobility dream. And, appropriately, the car forces a cyclist off the road. Sure, I'm reading too much into it. That's what's fun about it. Nevertheless, it pinpoints certain historical moments of clarity that highlight the rise of the automobile. There have been a few times that I've experienced the end of a ciclovia on Sundays in various cities. Wide boulevards closed to cars for the day finally open up to car traffic again. I've seen in Mexico City, Vitoria, Brazil and in Rio de Janeiro. The latter was most poignant. I was at the far end of Le Blon when the boulevard along the beaches of Le Blon, Ipanema and Copacabana was being handed back to cars after a splendid day. Police cars led the tide. Lights flashing, horns blaring, they led a veritable tsunami of automobiles down the boulevard. Crawling impatiently and aggressively behind the police cars. The last pedestrians, skateboarders and bicycle users scrambled to get out of the way. It was like witnessing the Big Bang of automobile culture. It was melancholy and yet it serves to inspire everything we do at our company.